Eggplant. It’s been good to have you through this cruel summer, the hottest and dryest in decades. Sweet, firm, smooth, full of the flavor of Arabian nights. We did a lot of nice things together, hot things. This is the last time. In a short while you will be spongy, seedy and quite frankly, limp. I don’t want you in the winter. Please don’t call me, I will ignore you. But thank you, you’ve been nice, lovely actually. Pierce eggplants several times with a fork and place them on a baking sheet lined with aluminum foil. Bake in preheated oven at 220 C (430 ° F) until very soft. Turn them around every 20 min so they cook evenly. Let them cool, peel, chop roughly and transfer in a colander with a weight on top to drain the excess moisture. I bake the eggplants the night before, place them in a colander to drain and finish the dish a day later so the rest of the preparation is quick and convenient. Chop the onions finely and saute in two tablespoons olive oil until translucent. Add the chopped eggplants and cook uncovered for 10-15 min. This will dry them further and bring out the flavor. Stir occasionally. Add the minced garlic and torn basil leaves, cook for further 5 min, season with salt and black pepper to taste and let it cool. Transfer in a food processor, add the ricotta and toasted almonds and puree until smooth. Just before serving, shred the uncooked zucchini and toss with olive oil, salt and a squirt of lemon juice. Arrange the zucchini shreds in a ring shape on a serving plate. 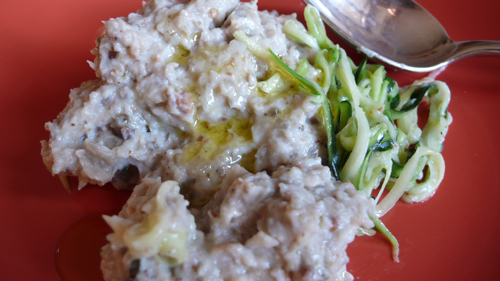 Pile the eggplant puree in the centre of the zucchini ring, drizzle with olive oil and sprinkle with fresh basil. Serve with toasted crusty bread, pita or as a side vegetable to roasted meat. It’s great party food, a sort of Italianized baba ganoush that might please even the unlucky few that don’t love eggplants. I adore them, in the summer. From one eggplant lover to another. This looks spectacular! It is what i’ve grown to expect from you. hahaha it’s over! Ok, so I’m having an internationally renowned artist and his Milanese architect wife over for aperitivi on Sunday and have been fretting about what I should serve. I am going to make this and serve it with some cut up veggies and a cracked-in-pieces piemontese “lingua”, together with a nice Grignolino. Thank you, love. You’ve saved me once more. make a brindisi to me, hugs! Beautifully written, as always! And delicious as well. Hi Joann and thank yo for visting! the stuffed figs on yor blog are amazing, I’d want one now! 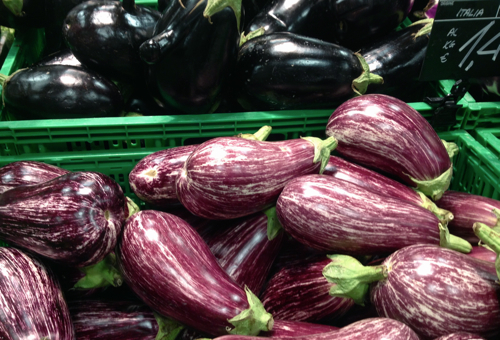 I am addicted to eggplant… I cannot believe you will be shunning it in the winter! Anyway, I cannot wait to try this recipe, I’m always on the prowl for new eggplant recipes and this looks delicious. Thank you Carmen, I also love it but I am a big fan of seasonal food. Eggplant in the winter is grown in a greenhouse, it’s stuffed with pesticides and fertilizers and it has no taste. I’d rather wait 🙂 ! I also strictly believe in using only fresh, seasonal produce. Many years of living in Greece where women – urban and rural – still shop for produce at outdoor produce markets and change their recipes with the seasons became part of me, and that’s the way I always cook now. I totally agree. It has gotten to the point that if ever I am tempted to buy something off season (we have eggplants, peppers and artichokes now for most of our winter) I can hardly eat hem as they are so tasteless!